Since her debut in the pages of "All Star Comics" nearly 75 years ago, Wonder Woman has gone on to become easily the most recognizable female superhero; a hero every bit as iconic as her DC brethren, Batman and Superman. Considering her revered status, it's mind-boggling that the Amazonian princess is only just now, in 2017, getting her first solo feature film. Wonder Woman's fans have waited decades to see her treated right on the big screen as Hollywood has shown a frustrating reluctance to release any film starring a female comic book character. Even Marvel Studios, for all its successes, has yet to release a women-fronted superhero flick as part of its current cinematic universe (the first won't be until "Captain Marvel" in 2019). Sexist tendencies aside, the DC Extended Universe has had its own rocky start. From the so-so "Man of Steel" to the even less successful "Superman v Batman: Dawn of Justice" and the abysmal "Suicide Squad," the studio's ability to do justice to their popular stable of characters has rightfully been called into question. Add in the fact that "Wonder Woman" is the rare studio blockbuster helmed by a female director -- Patty Jenkins, whose last film was the Oscar-winning "Monster" 14 years ago -- there's a mountain of pressure and expectations for "Wonder Woman." I'm here to ease your fears. In telling the origins of Princess Diana, Jenkins and company deliver a film that finally gives the beloved warrior princess her due. The film may have its flaws, but what it gets right is so fantastic that I can't imagine many fans leaving disappointed. Following an unnecessary framing device featuring Diana (portrayed, as in "Batman v Superman: Dawn of Justice," by Israeli actor Gal Gadot) in present day, the film begins decades earlier on the island paradise of Themyscira. The utopia is home to the Amazons, a race of powerful female warriors created by the mighty Zeus to help defeat his malevolent son, Ares, the god of war. Later, the Amazons sealed themselves off from mankind, living a secluded existence in peaceful harmony. Over the objections of her mother, Queen Hippolyta (Connie Nielsen), young Diana is trained in the art of war by her aunt, the fierce General Antiope (Robin Wright), should the need for the Amazonian forces ever arise again. That day comes when an American spy, Steve Trevor (an endlessly charming Chris Pine), crashes his plane on the island while attempting to evade a battalion of German soldiers. 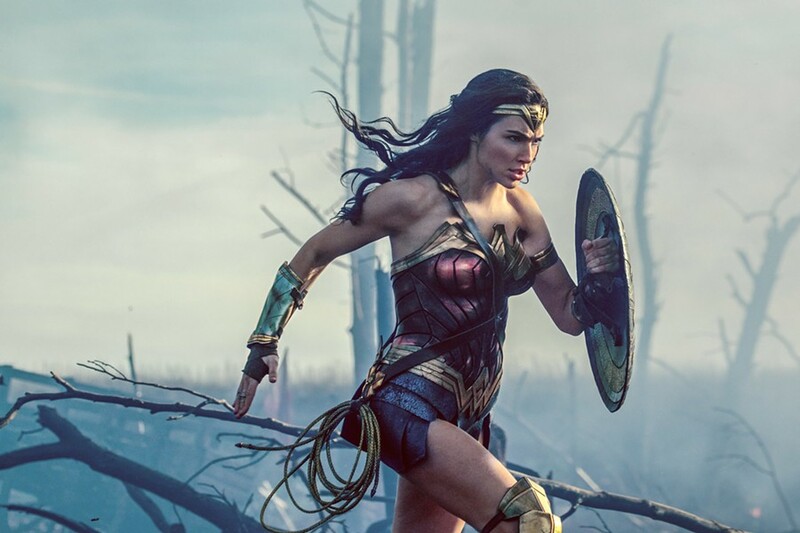 This leads to the film's first large-scale action sequence (and one of its best), when the Amazons engage the invading Germans in a beachfront battle -- World War I suddenly arrives on the doorstep of Themyscira. After this confrontation, and upon hearing details of the devastating conflict that has embroiled all of humanity -- the war to end all wars -- Diana becomes convinced Ares must be to blame. If she defeats him, she's confident that the world will be able to live in peace and harmony once more. Diana returns to London with Steve, where she joins his efforts to deliver a vital piece of information which could bring down the maniacal General Erich Ludendorff (Danny Huston) and his sadistic chief chemist Doctor Maru (Elena Anaya), and help bring the war to a swift end. On their mission, they're joined by a ragtag band of Steve's comrades: Charlie (EwenBremner), a Scottish sharpshooter; Chief (Eugene Brave Rock) a Native American smuggler; and the silver-tongued Sameer (SaïdTaghmaoui). Despite fighting alongside these brave individuals, it doesn't take Diana long to learn that we mortals are more than capable of destroying one another on our own, with or without the influence of the gods. The most crucial thing "Wonder Woman" gets right is the casting of Gadot. Radiating strength and grace, she's exactly what you want from a big screen Wonder Woman. And thanks to Gadot's electric chemistry with Pine, the film boasts one of the most successful romantic storylines in any superhero film to date. As Jenkins demonstrates an admirable willingness to spend time letting characters talk and interact, the two get plenty of moments to shine -- never more so than during a scene where they share a post-battle dance in the town square of a Belgian village they've helped to defend. There's a retro spirit of adventure to "Wonder Woman" that draws clear inspiration from Richard Donner's 1978 "Superman" and Joe Johnston's "Captain America: The First Avenger" (there's enough evidence of that film here that you half expect Ludendorff to let out a "Hail Hydra" at any moment). The screenplay, by comic book writer Allan Heinberg (with additional story credits for Zack Snyder along with Heinberg and Jason Fuchs), injects a welcome dose of humor. Aside from Diana and Steve's delightful banter, the efforts by Steve and his secretary, Etta Candy (Lucy Davis), to help Diana blend into British society lends some gentle fish-out-of-water comedy in the vein of Marvel's first "Thor" movie. Also credit to Jenkins and cinematographer Matthew Jensen for adding a touch of color to the world of DC. Themyscira in particular is a joy to look at, with its cerulean seas, verdant hills, and golden armor adding to the warmth of the environment. "Wonder Woman" has an earnest sincerity and heart that's been sorely lacking in the previous DCEU films. DC's heroes have always differed from Marvel's in that they're larger than life figures: godlike, without the flaws and frailties of the human race. The film's biggest conflict comes from Diana's struggle to rectify her duties as a protector of humanity with being a direct witness to the evil that men willingly do to one another. "Man of Steel" and "Batman v Superman" both attempted to tackle similar ideas, but were too often undone by sloppy storytelling, character inconsistencies, and a ponderous tone. "Wonder Woman" returns to the DC universe the idea of superheroes as hopeful, inspirational figures, working toward the betterment of mankind. Jenkins brings a light touch to the material, and thankfully doesn't get bogged down with working in references to the rest of the Justice League (no sitting around watching security camera footage this time). Of course, there are nits to be picked: you have to overlook some occasionally terrible CGI and green screening (seriously DC, what happened there? ), and the film feels forced to incorporate what have come to be trademark elements of the DC house style. There are plenty of what feel like characteristic Zack Snyder touches: speed-ramping is used as a crutch for creating iconic moments, and there's the obligatory climax revolving around CGI characters throwing heavy things at each other (though Jenkins at least manages to hold that off as long as possible). These are, unsurprisingly, the parts of the film that are least successful. Wonder Woman is a character who means so much to so many, and for any of the film's inconsistencies, it gets her character right. Jenkins delivers all of the stirring emotion, action, and fun that fans could want, and perhaps the highest praise I can offer the film is that I hope it's only the beginning of Wonder Woman's adventures on the big screen. EDITOR'S NOTE: This article has been updated to clarify that Marvel hasn't released a female-fronted movie as part of its current cinematic universe. Marvel and 20th Century Fox did release "Elektra" in 2005.